Making others laugh reboots the office for the remainder of the day to function more collaboratively, which tends to lead others to be creatively expressive. Commercial real estate is serious stuff. The staff spends 90% of their days anywhere from managing corporate portfolios, to scoping out the market for co-investment opportunities, to maintaining investor and client relations. None of which are anything to joke about when we are creating financial real estate wealth building strategies — ugh. But when 3 pm hits, “Laughter Hour” begins. I’m not sure exactly why or what takes over me but like clockwork at this time of day, almost every day, my polar opposite personality breaks free and it changes the mood of the office within minutes. The office environment also sounds and looks almost completely different than the one that existed just moments before. 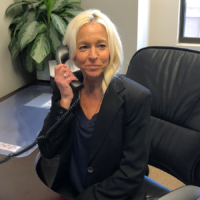 One form of entertainment I have is playing practical jokes on people in the office and I always have (without asking) a partner to partake in my shenanigans, and that is our spunky EVP Julie Dunlap. Like myself, Julie is ultra serious for the majority of the day but it doesn’t take much for me to get her involved. For instance, this one time there was a large recycling bin sitting outside Damian McKinney (the CEO’s) office. 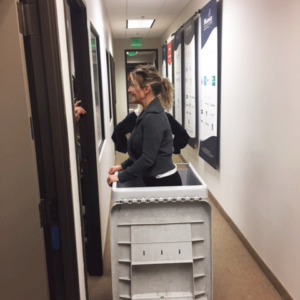 The bin was so huge and completely empty that it immediately sparked an idea…to get in the bin and pop out when Damian comes out of his office. But I knew I needed help getting into the bin. So like always, I run into Julie’s office laughing hysterically and I tell her to get in the bin. Within a split second she agrees and then we go back in the hallway, she climbs on a file cabinet so she can jump into it and bend down with the lid closed. The real comedy in this probably isn’t the practical joke itself but rather my planning and non-stop laughter while I’m trying to orchestrate these goofy things. 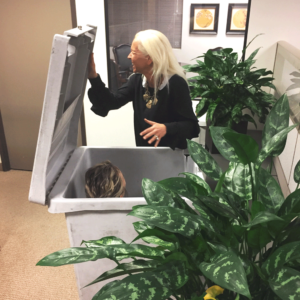 The staff watches in amazement that I so easily can get Julie into a large recycling bin, and also that I do these things to our conservative CEO. But I know how much Damian likes to laugh too and that he enjoys humor. Whether I am able to pull off the joke or not is not what’s important. What is important is finding a reason to smile and laugh every day. I believe that managers need to provide an environment where staff can be genuinely themselves, let their personality come through and let them shine. So when the staff sees me able to laugh at myself or make others laugh it reboots the office for the remainder of the day to function more collaboratively, which tends to lead others to be creatively expressive. “Staff that laugh together, stay together”, and there’s proof of this in an 18-year working relationship that I have had with both Damian and Julie.